Some people in new Mia Love attack ad say their images were ‘stolen’ from old ad they did in support of Ben McAdams. They demand it stop airing. 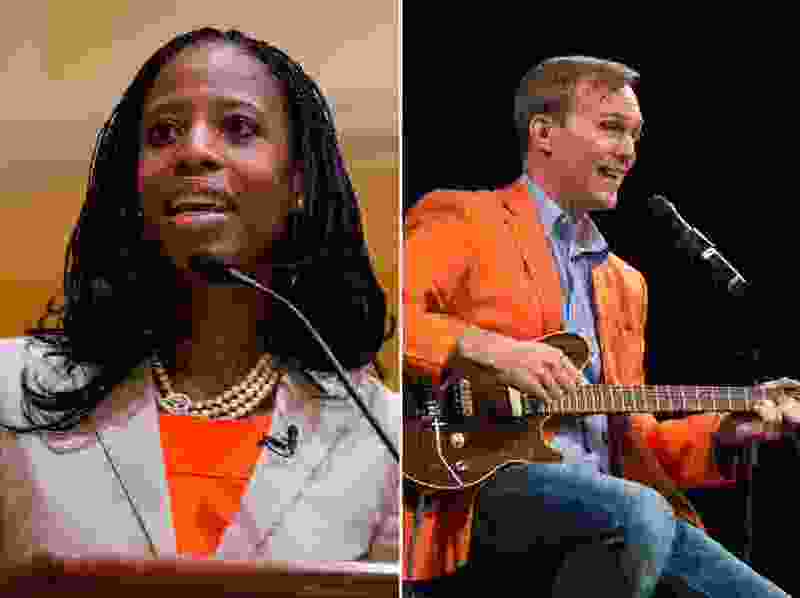 (Tribune file photos) Mia Love, left, and Ben McAdams, right, historically have both used orange in their campaigns. Don and Marilyn Remington, both 87, were astonished to see themselves on a TV ad for GOP Rep. Mia Love — and say her campaign “stole” their images from an ad they did two years ago for her opponent, Democratic Salt Lake County Mayor Ben McAdams. So a lawyer for the Remingtons sent a letter to the Love campaign on Thursday demanding that their images be removed from the ad, contending that it breaks state law. The letter also went to local TV stations demanding that they stop airing it. Dave Hansen, Love’s campaign manager, dismissed it as “political harassment from the McAdams campaign,” and said Love’s actions are legal. The new ad starts by showing a group of people boarding the “Ben Bus,” an orange school bus that McAdams uses to tour his district, and then drives away. The Remingtons are among those walking onto the bus. The ad then cuts to new footage showing people inside the bus being jostled around — “It’s a bumpy ride on Ben’s bus” — as they hear claims that McAdams has raised taxes or hired aides at high salaries — and they get off. Tom Love — no relation to Mia — the president of Love Communications, said Mia Love’s campaign “misappropriated images from an ad we shot for McAdams two years ago without permission” and used it in the short opening shots for her new ad. Tom Love said he produced the ad for an earlier mayoral campaign by using friends and family — including the Remingtons — for the group shots. He wrote that using their images without permission violates the Utah Abuse of Personal Identity Act. “Your use of their likenesses, taken from the McAdams campaign advertisement, is not incidental, and falsely implies that the Remingtons want to get off the Ben Bus and do not support Ben McAdams for Congress,” he wrote. The Love campaign has had somewhat of a bumpy ride itself in recent weeks. That includes the Federal Election Commission questioning if she illegally raised more than $1 million for a primary election that was never held. Her campaign agreed to refund or redesignate $370,000 of it that was raised after the Utah Republican Convention elected her as the party nominee, allowing her to skip the primary. Love’s campaign argues it was merely doing the same thing that the FEC had allowed Sen. Mike Lee to do in 2016 when he also did not have an in-party primary challenger. The situation allowed McAdams to claim last week that Love was paying for the controversial new TV ad with illegal campaign contributions, and has called for her to refund all the money raised for the primary that never occurred. Also, Love was recently criticized by The Salt Lake Tribune and Deseret News for mailers that seemed to attribute supportive statements to their editorial boards. One of those statements came from an essay that Love had written herself for The Tribune.